The west front of Newstead Abbey. The surviving remains of the priory church on the right have been described by Pevsner as "an execeptionally perfect example of a late 13th century church front". (A. Nicholson, 1997). In the same neighbourhood is the historic Newstead Abbey, the home of the Byrons, around whose ancient walls so many precious memories will ever cling. Who has not read Washington Irvings inimitable sketch, by far the most attractive that has yet been penned, or the pleasantly written introduction to Lord Byrons Life and Letters by Thomas Moore? The editors of innumerable editions of his lordships poems have each had something to say of Newstead and the Byron family, so that the subject has been amply discussed. But it has the rare merit of being never dull or uninteresting. No matter how much we have read or seen about Newstead Abbey, we can always recur to it with renewed delight. It possesses an especial interest that will last for all time, and cause it always to be thought of, or read of, with proud and pleasurable emotions. The same view of the west front as recorded by Samuel Buck, c. 1720. Above the cloisters are the corridors or galleries which connected all the rooms of the house, and the windows open into a quadrangular court, in the midst of which is a lofty and fantastic fountain, wrought of the same gray stone as the main edifice, symmetrical, but decked with carvings quaint. The chapter-house has been converted into a beautiful chapel, which is richly and appropriately adorned. The crypt is very extensive, and there is much that is ancient in other parts of the building to arrest the notice of the architect and the antiquary. Here in this fine abode, to quote the glowing words of Throsby, Calm religion sweetened the hours of those retired from the world and its vain allurements. And here the poor, the sick, the fatherless, the widow, and the weary traveller found at all times a comfortable asylum. But the record of most monasteries is very uneventful as far as the outer world is concerned, and there was nothing that we read of at Newstead out of the ordinary way of monastic life down to the sixteenth century. There would, in fact, be little to say about it had it not fallen into the hands of famous people. 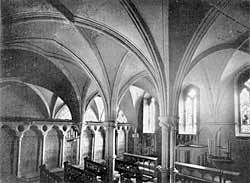 The 13th century Chapter House at Newstead was converted into a chapel in the 17th century.